The poem, “ Children Learn What They Live,” by Dorothy Law Nolte is such a powerful lesson for anyone who touches the lives of children. We used words in the poem for towns on our map. This project, which uses old road maps for the background, stresses the importance of how everything we do points us in the direction of our ultimate destination, heaven. 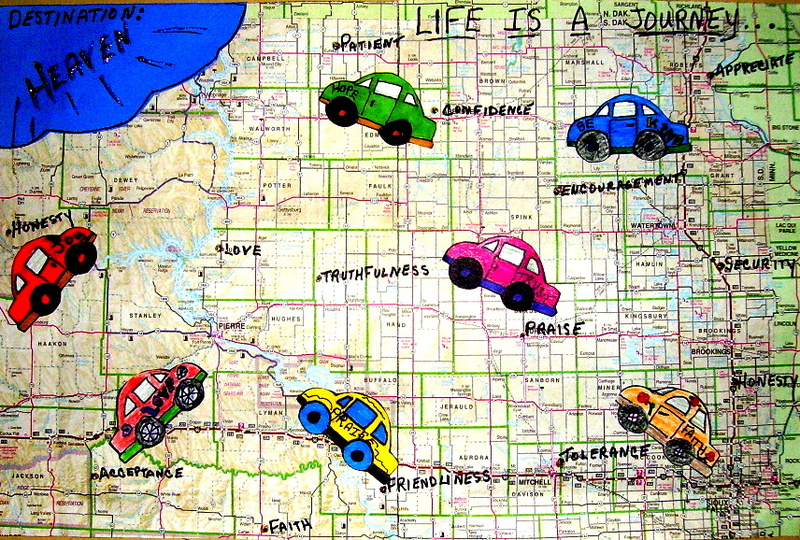 The supply list, directions and pattern for, “Life Is A Journey,” is in the 4th Grade Projects Gallery in the sidebar. This entry was posted in 4th Grade and tagged 4th grade, art project, children learn what they live, easy art for kids, easy classroom art projects, for kids, life is a journey, life is a journey craft project for kids, old road maps. Bookmark the permalink.